Drummuir Estate hosted goat keeping courses. Organisers of farming courses in Moray have experienced a surge in demand from locals wanting to turn their hand to crofting. Dozens or participants have attended tutorials in Drummuir and Craigellachie to learn about the practicalities of keeping animals. Students experienced live births of lambs to learn first-hand about the processes involved in bringing new farm animals into the world. Demand for the courses has proved so popular that organisers from the Scottish Crofting Federation have had to add extra dates. 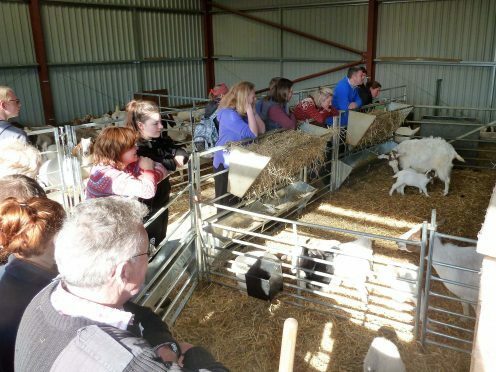 More than 40 locals have been learning about the tasks involved in lambing as well as how to tend to goats being reared to be sold as food. Mel Irvine, who ran the lambing lessons at Drummuir Estate, added: “It’s a great way for everyone to learn new skills, from the course, and also from each other. Keeping small ruminants, including sheep and goats, has been hailed as an organic way to reduce weeds while the animals produce meat, wool, milk and skins. Organisers are intending to capitalise on the demand for lessons by expanding the range of courses during the next two years. Patrick Krause, chief executive of the Scottish Crofting Federation, was encouraged to see a strong uptake for the existing tutorials in Moray. He said: “It’s really promising to be holding courses in such a new crofting area.